The Twin Ports Action Alliance, a group advocating for the removal of hydrogen fluoride, commissioned the survey using funds from a $5,000 grant it received from the Center for Health, Environment and Justice. Twin Ports Action Alliance co-founder Ginger Juel said the phone survey, which was conducted by KW Call Center Services in Superior, asked three questions of registered voters from Jan. 17 through Feb. 4 of this year. 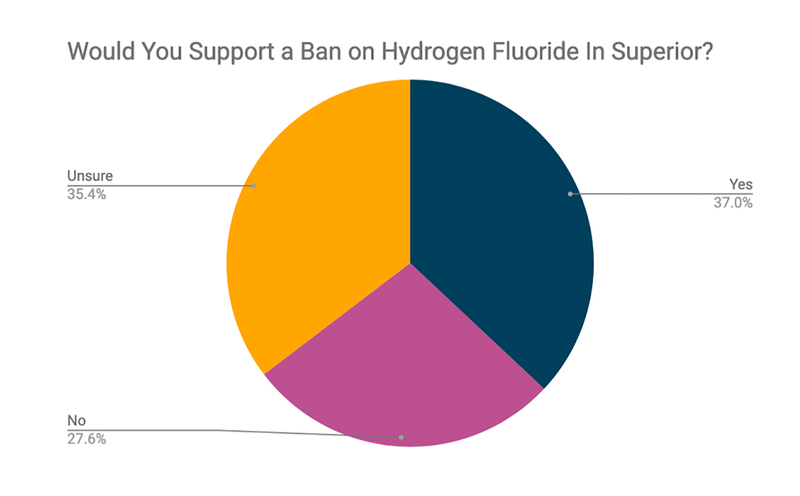 The questions gauged support for a ban on hydrogen fluoride in the city, whether they thought elected officials were doing enough to address the chemical’s use and whether people had an evacuation plan in the event of an emergency. The survey found 590 out of 1,595 respondents or 36.9 percent supported a ban while 441 or 27.6 percent were opposed. There were 564 individuals or 35.3 percent who were undecided. Juel said she wasn’t surprised by the survey’s findings. "There are people who are concerned. There are people who are uninformed. There are people who are uninformed and don’t care and there are others who truly believe that if Husky were to be forced to (remove) hydrogen fluoride they would leave our city," said Juel. Superior Mayor Jim Paine noted the survey was "very unscientific," adding the results were similar to what he’s been hearing from residents. He said some people are very concerned about the chemical’s use at the refinery. "The vast majority of people that responded are not terribly concerned with this," said Paine. "They feel that there’s not a significant safety risk and the fact is there’s just not." Paine said the most important safety issue with Husky is the risk of explosion, particularly during the shutdown of a refinery. Husky Energy was beginning a five-week turnaround process to conduct maintenance when the explosion and fires occurred on April 26 last year. A senior advisor with the Chemical Safety Board told WPR that shut-downs and start-ups are generally the most dangerous periods for refineries. "Those explosions we now know are preventable and we need to make sure that they never happen again at this refinery or any other one," said Paine. However, Juel believes residents are being misled about the dangers of hydrogen fluoride. The highly toxic chemical attacks mucous membranes and can cause lung damage and other health issues when people are exposed. She fears not enough is being done to hold Husky Energy accountable and protect the community. She also said she’s been hearing from some residents that the issue is being posed as a choice between economic benefits of the refinery and public safety. "They can’t afford both," said Juel of the refinery transitioning from hydrogen fluoride. "It’s one or the other. It’s rebuilding or it’s putting in new technology; therefore, they won’t rebuild." Superior’s mayor said Husky Energy officials did say it would likely be an expensive transition, but he noted safer alternatives to hydrogen fluoride do exist. "The refinery has a safer option available to them. They should pursue that," said Paine. "But, my position is also that the refinery needs to be in operation. We need to have that refinery open and operating as soon as possible — as soon as safely possible." The tank holding hydrogen fluoride was about 150 feet from the explosion at the refinery last April. However, the tank was not impacted by debris nor was it full on the day of the incident. The tank held around 15,000 pounds of the chemical on April 26, which reduced the area that could have been impacted. Husky Energy officials have also said that water systems added another layer of protection to minimize the impact of a potential release. "In regards to the survey, we do appreciate that this is a topic of concern," Husky spokesman Mel Duvall wrote in an email. "We continue to evaluate all of our options when it comes to rebuilding the refinery and look forward to discussing with the community when we are able. We still anticipate beginning construction later this year with phased operations resuming in 2020." Duvall added crews are arriving in Superior this week to begin preparations for demolition work at the refinery, which is expected to get underway next week. Still, Juel felt Superior's mayor should do more to protect the community from the risks. "I think that he should hold a press conference saying that he’s going to come out and he’s requesting all the city councilors to sign on to a letter, requesting the refinery not use hydrogen fluoride and demand an update in 30 days," she said. However, Paine noted there’s little regulatory power the city has over the refinery. "Generally, the regulations we have on them are the same as we have on any other property owner. It doesn’t really relate to the operations," he said. "They’re zoned industrial so they get to participate in industry."